Carpooling, walking or biking are the more satisfying commuting options, according to the findings of a survey released Wednesday. Those who drove alone and those who took Metro were the least satisfied. WASHINGTON — Commuters across the D.C. region look to more shared modes of traveling to work as driving alone becomes less popular. Carpooling, walking or biking are the more satisfying commuting options, according to the findings of a survey released Wednesday. The survey for Commuter Connections, a program run through the Metropolitan Washington Council of Governments, says people who biked or walked to work reported the highest satisfaction with their trips to work, followed by carpoolers. Carpoolers get additional benefits in many parts of the region, such as taking advantage of HOV lanes or using Express Lanes for free. Those who drove alone and those who took Metro were the least satisfied. “Respondents who drove alone and those who rode transit gave lower ratings for transportation satisfaction than did carpoolers/vanpoolers and bike/walk commuters. Only 34 percent of drive-alone commuters, 38 percent of train riders and 41 percent of bus riders were satisfied, compared with 47 percent of carpoolers and 61 percent of commuters who biked/walked to work,” the technical report’s summary said. Based on the telephone and internet survey of 5,903 employed adult residents of the region, which was adjusted to reflect the age and demographic distributions across the region, people living in Alexandria, Arlington and D.C. are the most satisfied with their transportation. Satisfaction was slightly lower in Montgomery, Fairfax and Prince George’s counties and significantly lower in areas farther from the Capital Beltway. The survey also suggests only 36 percent of workers in the region are satisfied with the area’s transportation system. Those in the inner core area were more likely to say they are satisfied with transportation (44 percent) than those in the outer suburbs (28 percent). Overall, the survey suggests that 61 percent of weekly commute trips across the region are made by people driving alone, down from 71.4 percent in 2004. About 20 percent of commute trips are taken on transit, 5 percent by carpool or vanpool and 3 percent by walking or biking. In the District, Alexandria and Arlington, 41 percent of commuters drive to work alone. 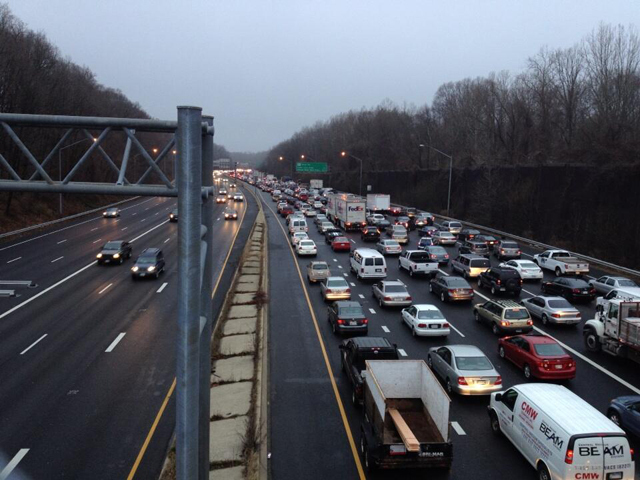 In Fairfax, Montgomery and Prince George’s counties, 65 percent drive alone. In Prince William, Loudoun, Frederick (Maryland), Charles and Calvert counties 75 percent drive alone. Most commuters in the region do have free parking at work, although federal workers and nonprofit employees are least likely to get the benefit. Only 31 percent of people who work in D.C., Arlington or Alexandria have free parking provided by their employer. For Metrorail riders, satisfaction has declined sharply over the last few years, and in this survey it’s down from 67 percent in 2013 to 48 percent today. Internal Metro numbers are slightly different, but reflect a similar decline. Along with an increase in the percentage of transit trips over previous years, the region has seen a spike in teleworking, which keeps hundreds of thousands of commuters from joining the crush of traffic or transit on a regular basis. Telework has eliminated about 10.2 percent of weekday commute trips. About 45 percent of the region’s workers can work from home at least occasionally. In part, one draw of telework is knowing when the day will begin. On average, the survey finds, commutes take 39 minutes to go 17.3 miles, and must include about 12 extra minutes, or about 30 percent of the expected time, to factor in potential traffic delays.